This is a celebration cake so lets celebrate! I baked this cake to celebrate my blog being in the Marin IJ today. OMG, I just saw that I’m on the front page! You can click here to see the article if your interested in viewing it, come on, check it out! This chocolate cake was actually one of the first recipes I posted on my blog, (way back in October) and I wanted to post it again with some updates because it’s just that good folks! Seriously, this is the best chocolate cake and it’s pretty famous among my group of friends. I’m always getting requests to bake this cake for dinner parties, birthday celebrations, or just for plain old enjoyment. I’m a total cake gal. Give me the choice of cake or ice cream and cake will always win hands down. I’ve since made this cake into cupcakes and honestly they taste just as good and as moist as the cake, and don’t dry out like typical cupcakes. This cake is super chocolaty and moist, and the cream cheese frosting adds a perfect balance to the cake, making it not too sweet! Zoe brought a piece to school the other day to share at lunchtime and there was a long line for just one bite! You guessed it coffee! I actually brew a strong batch of Peet’s coffee (love that stuff). When my kids first saw me add coffee to the batter, they were like, “Mom what are you doing adding coffee to the batter, the cake is going to be sooo gross.” I smiled and told them to “trust me” and they did, and loved it. So now when they see me adding a bit of wine or vodka to a dish, they do not question me, they may make a yucky face, but they just go with it. Anyway, I am getting off track here, below is the recipe for the actual cake. 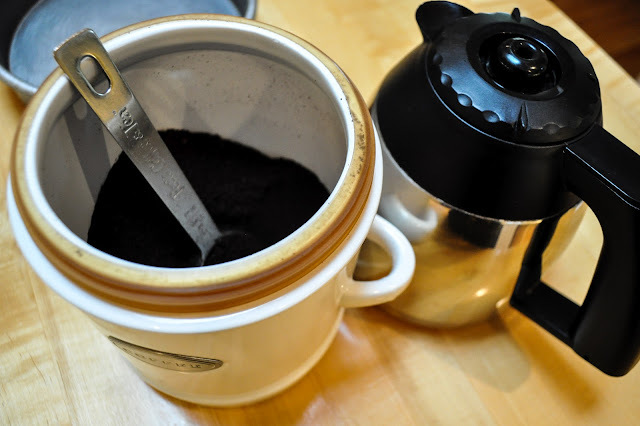 1 cup freshly brewed good quality hot coffee- Don’t be turned off by the coffee in the recipe, you honestly don’t taste it at all. The coffee enhances the flavor of the cocoa powder, resulting in a more chocolaty cake, not a coffee-flavored one. Let’s start out by making the chocolate cake. Preheat the oven to 350 degrees (I have 2 oven’s so I preheat both). Butter two 8-inch round cake pans. 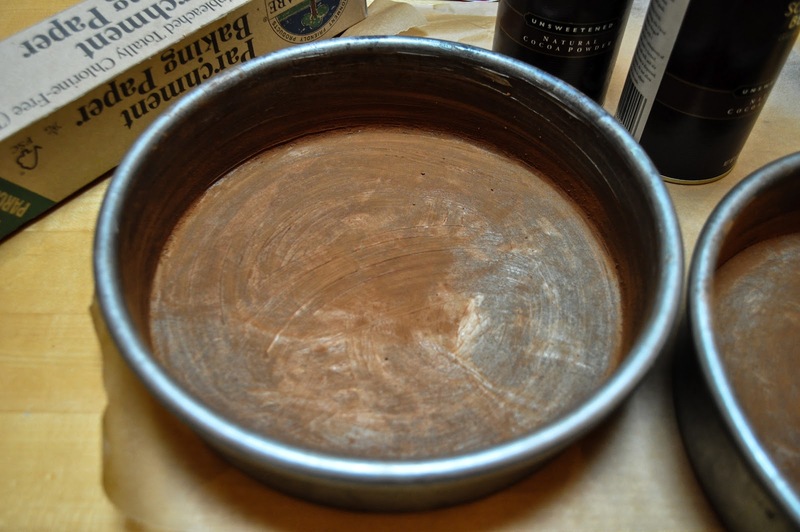 Line the bottom of the pans with parchment paper. Tip: I trace the pans on the parchment paper to get the correct size, and then cut out the circles and place them on the bottom of the buttered pans. 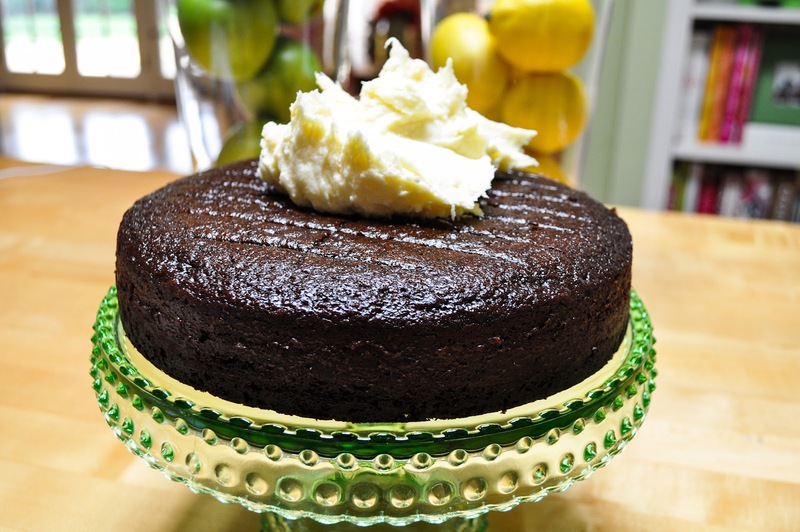 Tip: I use cocoa powder instead of flour when making this cake. It totally works and you’re not left with any white flour on your cake. Here are 2 more quick tips before I go on! 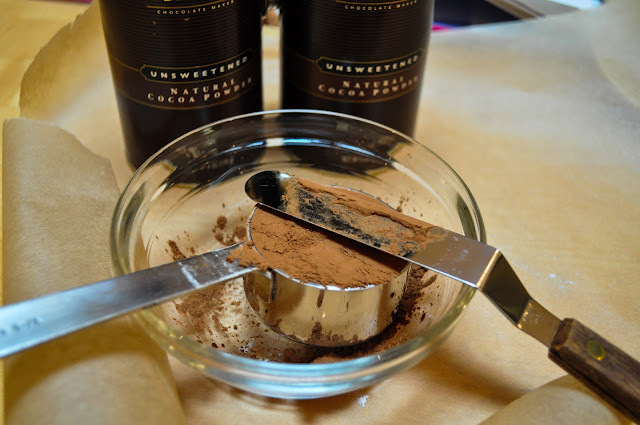 Tip: In order not to waste that precious and expensive cocoa powder, measure over a bowl and parchment paper so the excess can be put back in the container after. 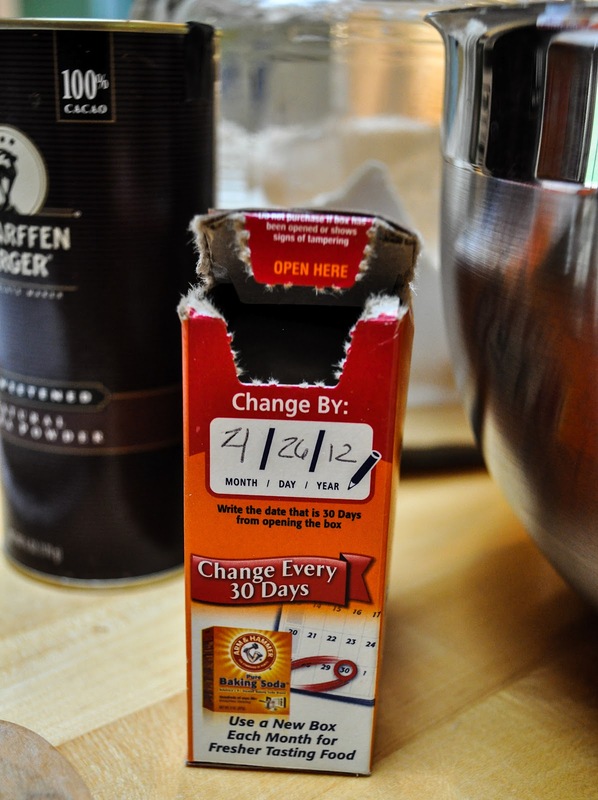 Tip: To make sure you always have fresh baking soda, fill out the “change by” section on the box when you open it. I have started doing that, and found it really makes a difference. I mean who honestly remembers when they bought their baking soda. It really helps to have fresh baking soda when baking. With either a hand held mixer or an electric mixer fitted with a paddle attachment, on low speed, slowly add the wet ingredients to the dry. 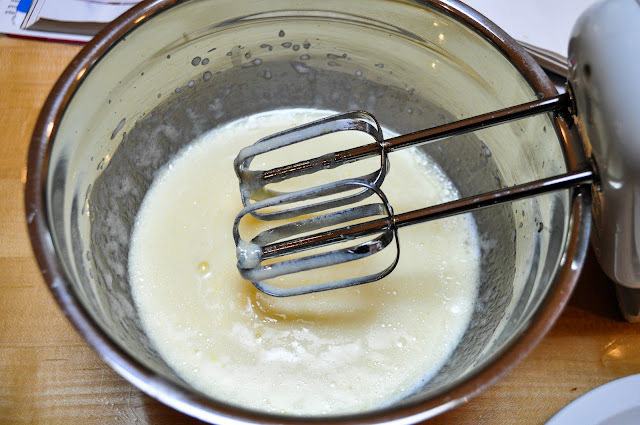 This is what your batter will look like once the wet and dry ingredients are combined and before you add the coffee. It will be pretty thick. Now it’s time to add that freshly brewed coffee. I always use a good strong coffee like Peets. I don’t know if that’s what makes the cake taste so rich, but I’m sure it has some part to play in it. With the mixer still on low, add the 1 cup coffee and mix until combined, scraping the bottom of the bowl with a rubber spatula. Sidetrack here, doesn’t that coffee look good? I always make sure I make enough for an extra cup to drink! 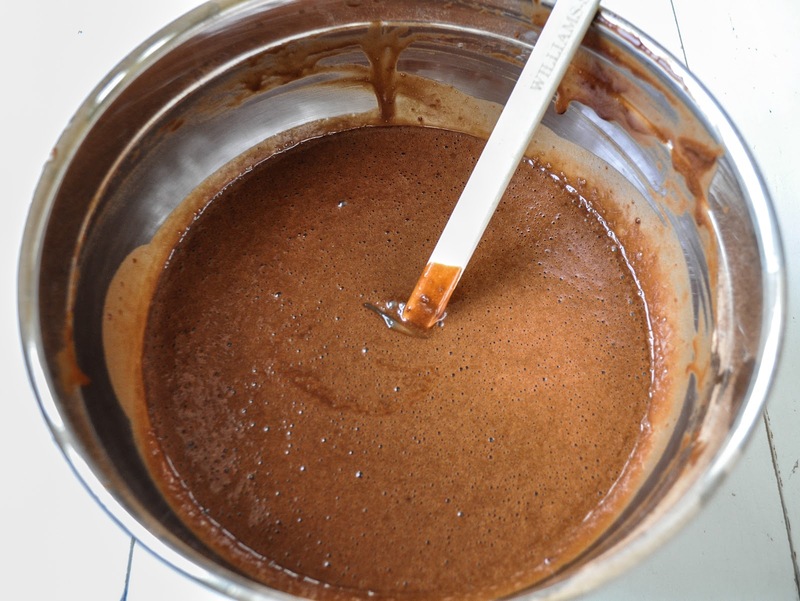 Below is what your mixture will look like before you pour it into the pans. See how much thinner it is once you add the coffee? Pour the batter into the prepared pans. Make sure you make them even. Bake the cakes for 35 to 40 minutes, until a cake tester or toothpick comes out clean. I have 2 ovens so my cakes are done at exactly 35 minutes. If you have one oven, place the oven rack in the middle of the oven and bake the cakes next to each other on the same rack. This will ensure even baking. Baking tip: It’s hard to give an exact cooking time when it comes to baking because every oven, pan and even geographic locations, can command a slightly different cooking time. A great way to know when a cake is done, is to do the finger test. Press your finger down gently in the middle of the cake, if it’s done, it should puff back up automatically on it own. If it stays dented, then the cake is not ready to come out yet. Also, a cake tester or toothpick inserted in the center should come out clean as well. Cool the cakes in the pans for 30 minutes, then turn them out onto a cooling rack and cool completely. After those cakes are completely cooled, it’s time to make the frosting. The frosting recipe was passed down from my dad. He’s actually a wonderful cook, as well as my mom. 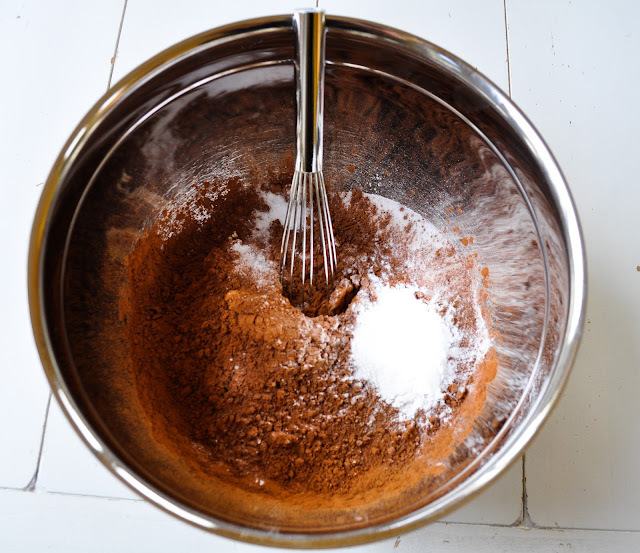 Pour 3-4 cups unsifted confectioners sugar into a sifter and sift the sugar into a large bowl and set aside. Sifting the sugar helps to ensure you don’t have lumpy frosting. Put your softened butter and cream cheese into a bowl and get your handy dandy mixer out. 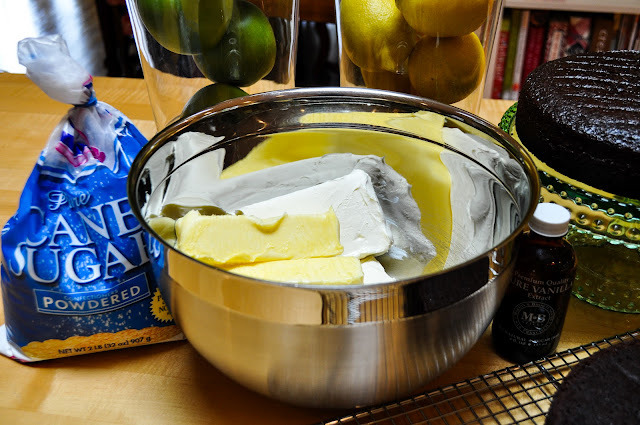 Beat the butter and cream cheese together on medium speed until well blended. Add the 2 teaspoons of vanilla and then slowly add the confectioner’s sugar to taste. Pour in at least a cup or two and then taste it. If you add to much confectioner’s sugar it will be really sweet and you won’t really get that cream cheese flavor. Just keep adding and tasting it till it reaches a flavor you like. You want it to be sweet, but not too sweet. I usually taste it and have my kids taste it as well. They are pretty accurate when it comes to the finished product! Below is what your finished product will look like! Yum! Scrape off the mixers and then save them for the kids to lick! 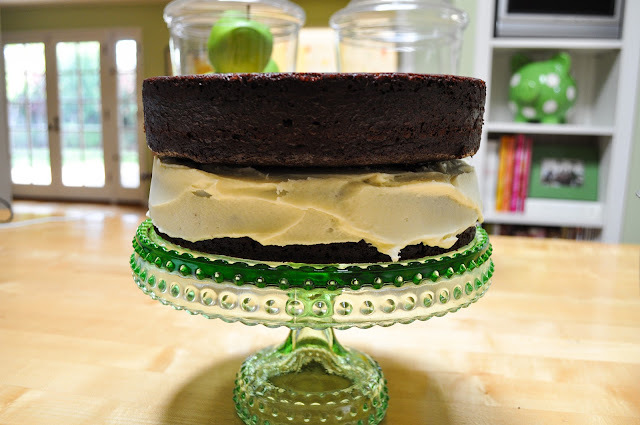 Put one cake layer on a flat plate or cake pedestal. With a frosting knife or spatula, spread the top with frosting. Then the side. 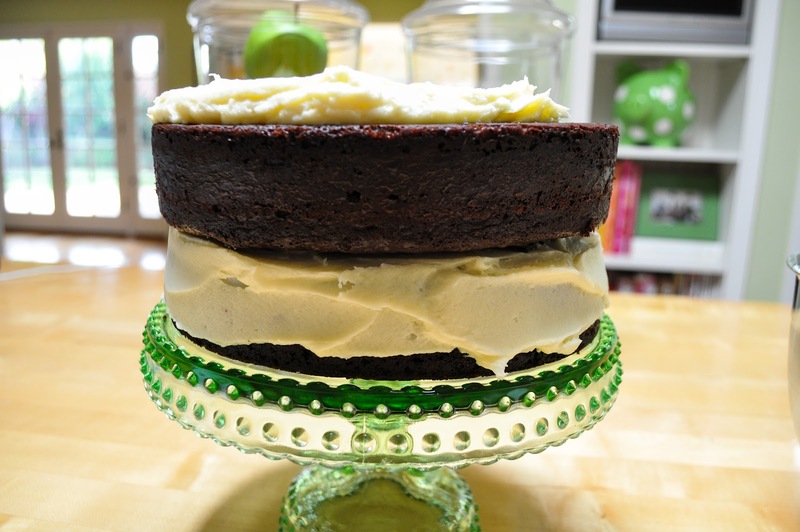 Once you spread the frosting on the top of the first (bottom) layer, its time to place the 2nd layer on top. I like to the place the top part of the 2nd layer (rounded part) upside down so that the flat side (bottom side) is up. It makes the cake look taller and prettier because you have the natural flat top. Now, frost away, making sure to spread the frosting around evenly on all sides and to get a nice fluffy layer on top. Tip: Warm your frosting knife/spatula under hot water then dry. This will help get sides of your cake smooth. This is what your cake will look like when you’re finished frosting it. Now, comes the fun part, the decorating! I didn’t decorate this particular cake because I was photographing it for the blog. Slice off a piece, (or two) and dollop it with some fresh vanilla ice cream or enjoy with a tall glass of milk. This cake is SO easy and SO good. As Barefoot would say, how easy is that? I’ve also made a cupcake version of this cake and I have to say that the cupcakes taste just as moist as the cake. Give them a try! 1 cup freshly brewed good quality hot coffee - Don't be turned off by the coffee in the recipe, you honestly don't taste it at all. The coffee enhances the flavor of the cocoa powder, resulting in a more chocolaty cake, not a coffee-flavored one. approximately 3-4 cups unsifted confectioners sugar - this is to taste - You will then sift the confectioners sugar so there are no lumps in the frosting. Let's start out by making the chocolate cake. Preheat the oven to 350 degrees (I have 2 oven's so I preheat both). 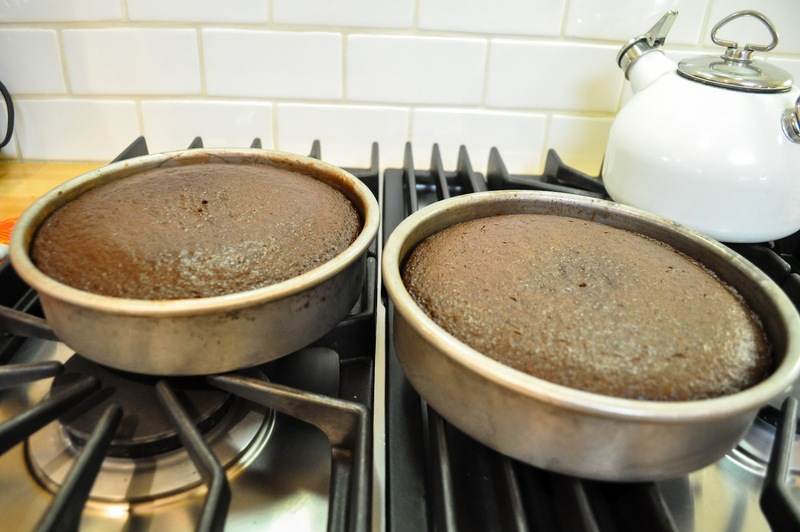 Butter two 8-inch round cake pans. Line the bottom of the pans with parchment paper. Butter and flour the pans. Tip: I use cocoa powder instead of flour when making this cake. It totally works and you're not left with any white flour on your cake. Your batter will be pretty thick at this point. Now it's time to add that freshly brewed coffee. I always use a good strong coffee like Peets. I don't know if that's what makes the cake taste so rich, but I'm sure it has some part to play in it. With the mixer still on low, add the 1 cup coffee and mix until combined, scraping the bottom of the bowl with a rubber spatula. The batter will be much thinner with the coffee added to it. Bake the cakes for 35 to 40 minutes, until a cake tester or toothpick comes out clean. I have 2 ovens so my cakes are done at exactly 35 minutes. If you have one oven, place the oven rack in the middle of the oven and bake the cakes next to each other on the same rack. This will ensure even baking. Baking tip: It's hard to give an exact cooking time when it comes to baking because every oven, pan and even geographic locations, can command a slightly different cooking time. A great way to know when a cake is done, is to do the finger test. Press your finger down gently in the middle of the cake, if it's done, it should puff back up automatically on it own. If it stays dented, then the cake is not ready to come out yet. Also, a cake tester or toothpick inserted in the center should come out clean as well. After those cakes are completely cooled, it's time to make the frosting. 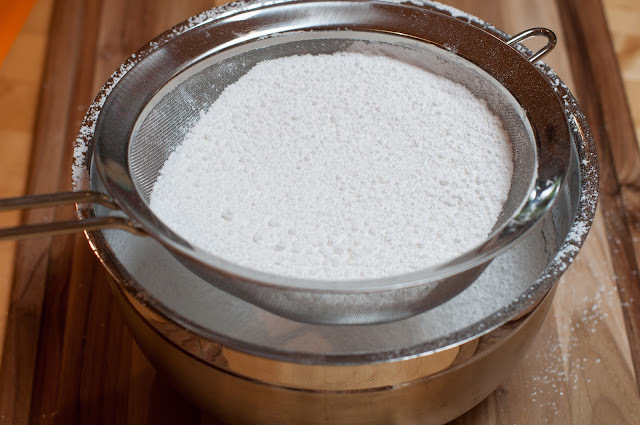 Pour 3-4 cups unsifted confectioners sugar into a sifter and sift the sugar into a large bowl and set aside. Sifting the sugar helps to ensure you don't have lumpy frosting. 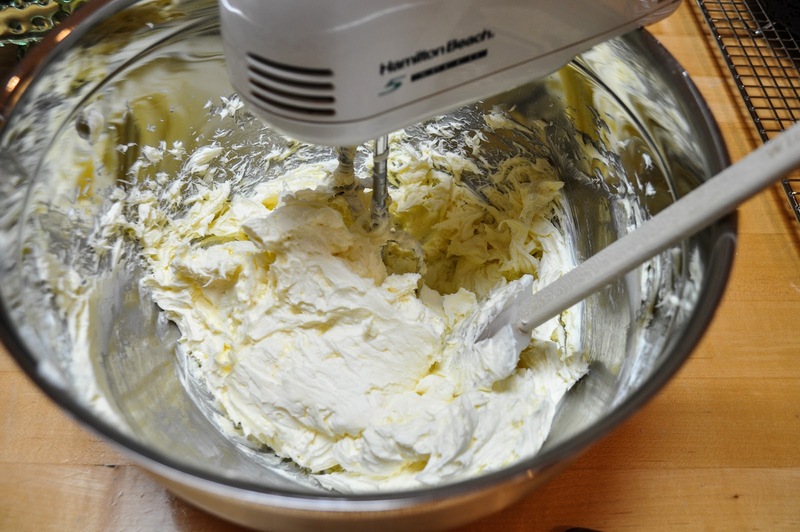 Put your softened butter and cream cheese into a bowl and get your handy dandy mixer out. Beat the butter and cream cheese together on medium speed until well blended. Add the 2 teaspoons of vanilla and then slowly add the confectioner's sugar to taste. Pour in at least a cup or two and then taste it. If you add to much confectioner's sugar it will be really sweet and you won't really get that cream cheese flavor. Just keep adding and tasting it till it reaches a flavor you like. You want it to be sweet, but not too sweet. I usually taste it and have my kids taste it as well. They are pretty accurate when it comes to the finished product! 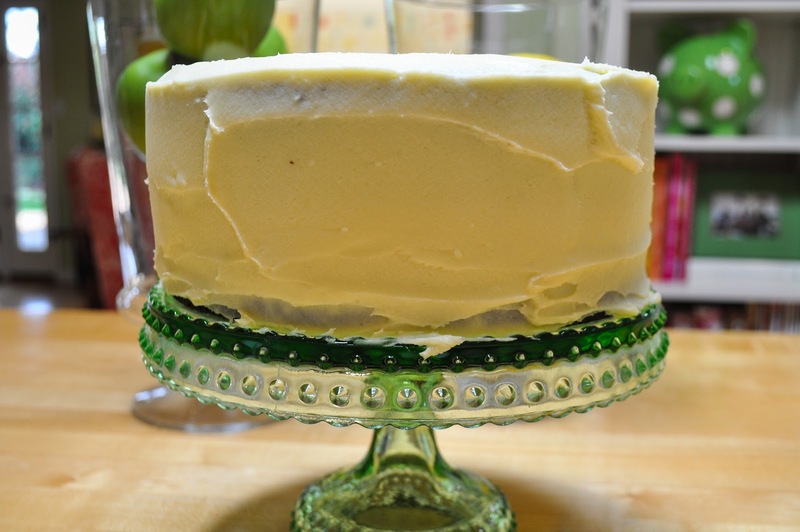 Put one cake layer on a flat plate or cake pedestal. With a frosting knife or spatula, spread the top with frosting. Then spread some frosting on the side. Once you spread the frosting on the top of the first (bottom) layer, its time to place the 2nd layer on top. I found your recipe and had a question, would putting coffee in the cake make it have caffeine? Seems like yes but not sure. Thanks !! Hi I would like to try this recipe for my sons first birthday.. 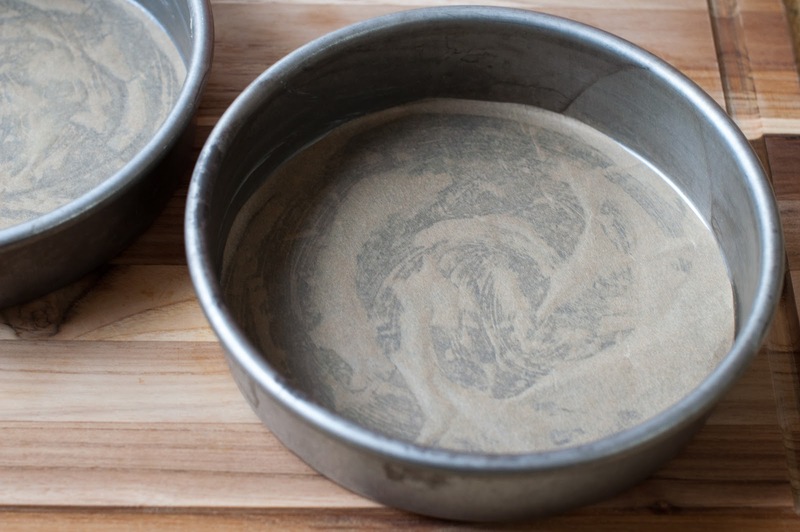 I am going to use two 10” round baking tins. Would it be ok to double the recipe, fill each equally then if there is left over make cup cakes? Sure, to be safe I would do as you suggested as I’m not the best at rounding up for different size pans when it comes to baking. Make sure to not overfill your pans, as you will have more batter than needed. I would fill up both pans no more than 2/3 full or the batter may overflow. When you increase recipes and bake in larger pans, you should anticipate longer baking—anywhere from a little longer if the pans are filled to the same level as the original recipe. My sons birthday was yesterday, and I have to say that everyone absolutely loved it and they all wanted the recipe. It’s definitely the best chocolate cake I’ve ever made and the only one I’ll be using from now on. I used 1 batter in a 10” pan and made two to place on top of eachother. Baked for exactly 45 minutes. I also used 1 batter to make about 25 cupcakes. I’ve tried the cupcake version and it was the best ever! Thank you so much for your recipe. I’m going to make this cake for my sister’s birthday and I just wanted to clarify the coffee content.. 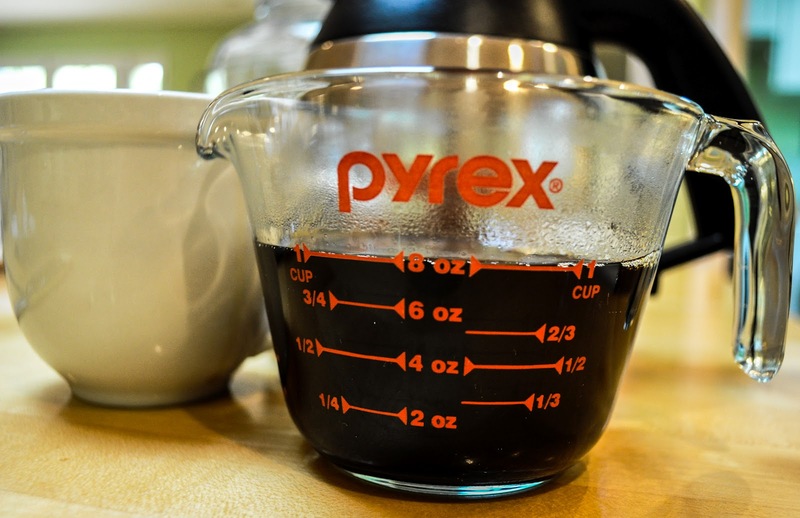 So to brew one cup of coffee, do you use one tablespoon of ground coffee or more? Thanks again for this amazing chocolate cake recipe. I still crave those cupcakes I made. I must thank you for the recipe again! It was amazing! So moist and light so it doesn’t get too sickly and it leaves you craving for more! Sounds amazing! Brownies HAVE to be fudgey. I’m actually really looking forward to making your sea salted chocolate cookies. I will feedback when I do. Thanks again! I’m think I’m going to make this cake for my son’s birthday party. How many cupcakes does this recipe make? You can double batch the recipe to get 24. Great recipe! I was worried that the batter was too thin after I added the coffee so I added about 1/2 c more flour. Then I realized you said the batter was supposed to be super thin. Luckily the extra flour didn’t make a difference. It was delicious! Wonderful flavor. Thanks so much! I cant wait to try this recipe this weekend for my dad’s birthday. He loves coconut, have you ever tried adding shredded sweetened coconut to the cream cheese frosting|? Moist and delicious cake! I was unsure of using the coffee because I dislike the taste of coffee, but the cake does not taste like coffee. Instead, it makes for a rich chocolate flavor that is complemented perfectly by the frosting. All of my family loved it, including my kids. My son wants me to make a cupcake version of the cake for his birthday. A fantastic recipe I will definitely make again! Thank you! Hey, I love this blog, and the cake looks absolutely delicious! Can’t wait to try it! I was just wondering, does the oven have to be preheated to 35- degrees Celsius or Fahrenheit? Also, if I let one pan of batter stand while I bake the other (I only have one oven) will it matter? Hi Ana! I’m so sorry not to get back to your comment sooner. It got lost in the shuffle and I didn’t see it till this moring as I was filtering through my comments. Ok, I would recommend baking both pans at the same time. Just use 2 racks and roate the pans halfway though to make sure that they each bake evenly. You can test the cakes the way I explain in the post. Take them out at the alloted time (30 minutes) and see where they are at. They may take a bit longer with 2 pans in the same oven. I have tried this chocolate cake twice. It is delicious. Hi Jackie! I’m an Italian mum living in The Netherlands. First of all: your blog is amazing! I really like your style and taste. I made this cake for my son’s first birthday and topped it with fresh strawberries. He absolutely loved it! I’m gonna make another one for some friends this weekend. Thank you for sharing this recipe! I just made this cake. I haven’t tested it but have tried some of the icing and its super delicious!! I was a little worried about whether or not I would need to refrigerate it because of the cream cheese in the icing? What do you think? Do you usually refrigerate yours?? Thanks in advance for your help!! I’d really like to try this cake recipe for my daughter’s upcoming birthday party – it looks and sounds delicious! I’m hoping you could give me some advice on how many people the reipe will feed. The guest list is 16 kids (ages 2-7) plus maybe 12 adults. I’m guessing kids will have fairly small pieces and maybe not every adult would eat cake. I don’t want to underestimate how much I need, but I also don’t want to wind up with a huge amount of extra cake! Do you think I should make the recipe as a 2 layer round cake (I have 9″ pans), a sheet cake (I saw comments that people had success with a 9×13″ pan, which I have ), or make the 24+ cupcakes? My hunch is that the round cake would be hard to cut into 20+ pieces. I found a diagram on how to cut a 9×13 sheet cake into 28 pieces, so I suppose that would work. I just wondered if you had any input 🙂 Thanks! That way you have a cake and big cake cookie. I’ve made up the skillet cookie for birthday celebrations before. It’s fun and unique and really takes no time to pull together. I baked it as a 9×13 and just cut the pieces small, so we ended up having enough. I would have liked to try the skillet cookie but I didn’t have enough time for it. I’m definitely going to try the recipe though! Hi Eileen. So glad you stumbled across my blog 🙂 Did you see my post on this cake in cupcake form? If not, I have a link at the bottom of this post. The cupcakes taste as moist as the cake! To be honest, I use regular old black coffee in this cake and have been using it for years. Both of my kids and their friends have not been affected by the caffeine. The coffee really enhances the flavor of the chocolate and you truly don’t taste coffee at all. To be honest, I don’t know about using expresso because isn’t expresso is a stronger brew? I’m not sure because I don’t drink expresso. If so, then it might be too much for this cake, but then again, it could be great. Good question about the sugar, no, you don’t need to add sugar to the coffee. The coffee is black. I should add that in the post, so thanks for that question! Yes, you can make your own buttermilk, if your grocery stores don’t carry it. I’ve never used a homemade buttermilk before. I do hear that the homemade stuff is not as good as the real thing. I would use whole milk instead of a low fat milk though. Here’s a link for a homemade buttermilk recipe. I’m sorry I don’t have all the answers! When it comes to baking, I tend to follow the recipe to a “T” and don’t substitute, because I’m not a professional baker. Hi, I followed the recipe but the cake come out too soft . Now I think that its for my country( I live in Medellin, 1475 msnm).I’m going to try these tip. Thanks to both of you!! I baked the cake this morning. It came out PERFECT ! I didn’t need to increase the quantity – your recipe for 2 x 8 inch round tins made 1 beautiful rectangular chocolate slab of 22 x 23cm ( 9 x 13 inch). It did not sink in the middle 🙂 I left the cool cake under clingfilm while we went to Father’s Day lunch and I’m going to ice it with Cream cheese icing this evening and decorate it with some ten-pin bowling themed cake toppers for tomorrow morning’s birthday party ! Will e-mail some photos when it is complete. Hi Tracey! I have to say that I have not doubled the recipe before, so I can’t tell you how it will turn out. I’m sure the recipe would be fine doubled and taste great, but the only thing that would be tough to gage is the cooking time, or if the cake would be too much to fill the pan (which I think it would if it the recipe was doubled). Here’s a website that I use when converting recipes to different pans. I think your pan converts to a 9 x 13, so check that one. I wish I could be of more help here, but for me when it comes to baking I tend to stick to the rules, as I don’t have the baking expertise to gage how different pan sizes will work. My go-to recipe for chocolate cake has always been Hershey’s Perfectly Chocolate Chocolate Cake … until now!! I stumbled on your recipe searching for “rich chocolate cake with cream cheese frosting.” I wanted to make a cake like the “Chocolate White Out” cake we get from our local bakery. It’s to die for. This exceeded our expectations. It’s fantastic. Interesting comparison with the Hershey’s recipe, which calls for boiling water. But the coffee in this recipe makes the cake so moist. From now on, when I make a chocolate cake, THIS is the recipe I’ll use. Thank you! Hi Lola! Yes, you can make and frost the cake the day before. I have done that on many occasions, especially before one of my kids’ birthdays. I mean who wants to spend all day baking a cake on their child’s birthday. If you make it the day before, just make sure to store it in an airtight container. I like to frost the cake the same day I make it because the frosting helps to keep the cake moist. If you want to make the cake the day before and then frost it the next day, then you need to tightly wrap the cakes (both halves individually) in plastic wrap so that they don’t dry out. Don’t just cover them in a container or loosely wrap them in plastic wrap or else the cakes will dry out. Keep them at room temp as well. My personal preference is to make and frost the cake the same day, that way you don’t have to worry about the cake drying out. I always store my frosted cake at room temp in an airtight container. Let me know if you have any other questions. Hi Lola! I don’t want to confuse you. What I meant at the bottom is that I like to make and frost my cake the same day, not make the cakes the day before and frost them the next day. Make sense? Awesome! I’m so glad to hear that the cake turned out great for you. It’s honestly my favorite cake recipe. No, I have not replaced the oil with butter. 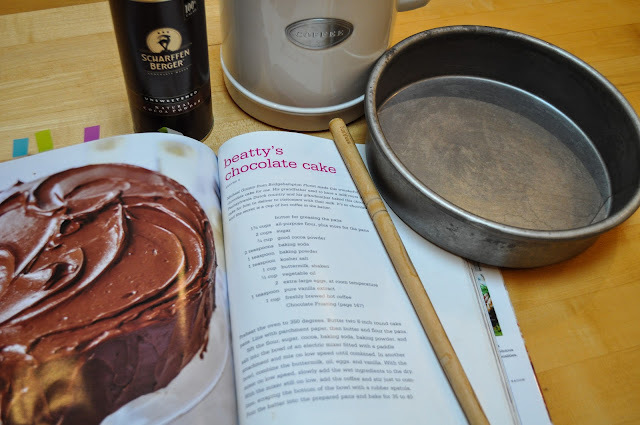 I really think it would change the consistency and texture of the cake as the oil helps to keep it moist. I know that people do substitute applesauce for oil in cakes, but I have yet to try that. There’s no need to refrigerate the cake. It does well at room temp as long as it’s covered. I keep mine out under my cake dome and it stays fresh for days! oh thank you, amazing cake and recipe. fast and easy loving the great taste!!!!! Hi Whitney! Yes, they do make cupcakes and they taste great! I have only made them once and that was about a year ago, but I think it took 20-22 minutes for a regular sized cupcake. If you’re going to do mini cupcakes, then it will take half that time, like 8-12 minutes. I will warn you that this batter makes a lot of cupcakes, I think I got 24 regular sized cupcakes. 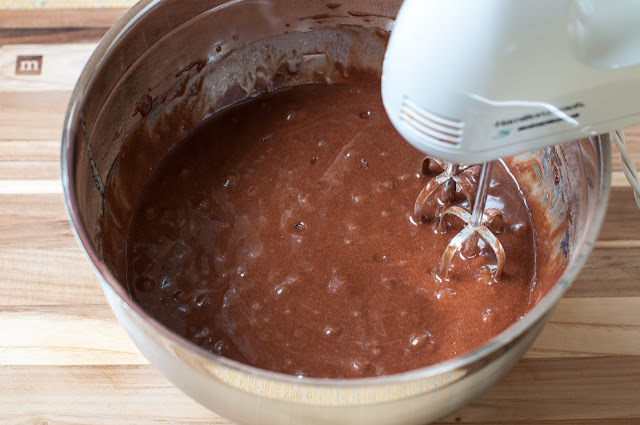 Also, the batter is not thick like a normal cupcake batter, so you may want to pour the batter into a large measuring cup with a pour spout and pour the batter in the cups or you can just use a cookie scoop as well. I would definitely use my finger test above to be your gage because ovens vary and cooking times therefore vary. I test muffins and cupcakes all the time with that handy finger test as well as the toothpick. It always works! Best of luck, and if you do make the cupcakes, let me know how they turned out as well as how long it took! You are going to laugh- In the one batch I got 24 regular cupcakes and 12 minis! I have a Convection oven so cooked at True Aero at 350F. All 3 tins on 3 different racks. I’m totally laughing, but I believe it. I gave up at 24 when I made them and remember there being leftover batter. Wow, what are you going to do with all those cupcakes? You know whats truly sad, I’ve never used the convection setting on my oven. I’ve had the same two ovens for 13 years and I know them so well that I’m afraid to use the convection and screw things up. I’m glad the cupcakes turned out great in the end, and frosting always makes things taste better and moister right? Thanks for letting me know how it all went down! Hi Lyn! Yes, you can make this cake. My 12 year old made this cake following the above step-by-step directions, and it came out amazing! I was making this cake before I knew how to bake, so I know that you will not have a problem. One tip, make sure that you dip your measuring cup into the flour and sugars and scoop and then scrape them with the edge of a knife. Baking is all about being precise. That’s just what I do with each new recipe I try and they always seem to come out perfectly. I don’t play around when it comes to baking. I would make the cake on Sunday rather than Saturday, so it’s fresh. Make sure your eggs are room temp before starting the cakes. 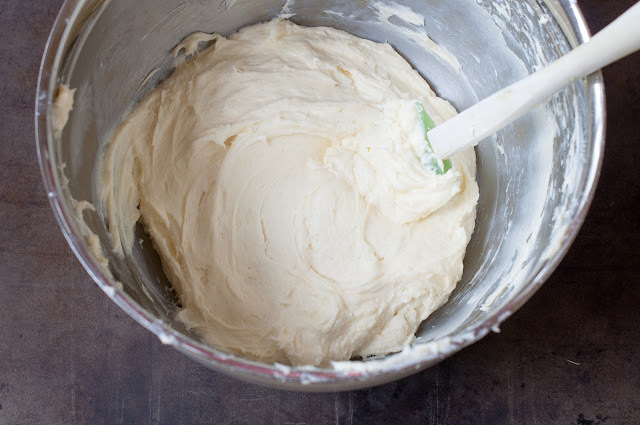 I always set out my butter and cream cheese at the same time I start the cake process, so I know they will be soft enough when it comes to frosting the cake. Jackie, the cake was DELICIOUS!! It was so easy to make, you were right and my husband loves it so much!! The cream cheese was just right and you can’t taste the coffee but it made it more chocolaty. I am so glad I found your blog and thanks for sharing this amazing recipe. This is now on my lists of my favorite recipes. Hi Lyn! AWESOME! I’m so happy you ended up making the cake and that it turned out to be an easy and tasty task. Thanks so much for letting me know how it turned out. I was curious if you had indeed made it and how it turned out, so it was great to hear from you. It is my only cake recipe to date. I have tried others, but I keep coming back to this one because its just such a crowd pleaser. I’m glad it’s made it to your list of favorites as well. Oh, and does brand and kind of coffee matter? I have a guatemala coffee beans from Starbucks. Will that work or do I have to buy a different kind? Thanks so much.. This looks DELICIOUS, I’m so glad I found this. I have a question, my husband’s birthday is on Monday but I’m planning on making him this cake this weekend, is this easy to make? I love to bake but this is going to be the first time baking a cake. Hope you have a wonderful day!! Hi Sharon! I’m sorry it deflated a bit for you! I hope it still tasted great. My best guess is that you took it out to soon? Cakes tend to deflate more when they are under baked. Here’s a great tip when baking a cake, do the finger test. 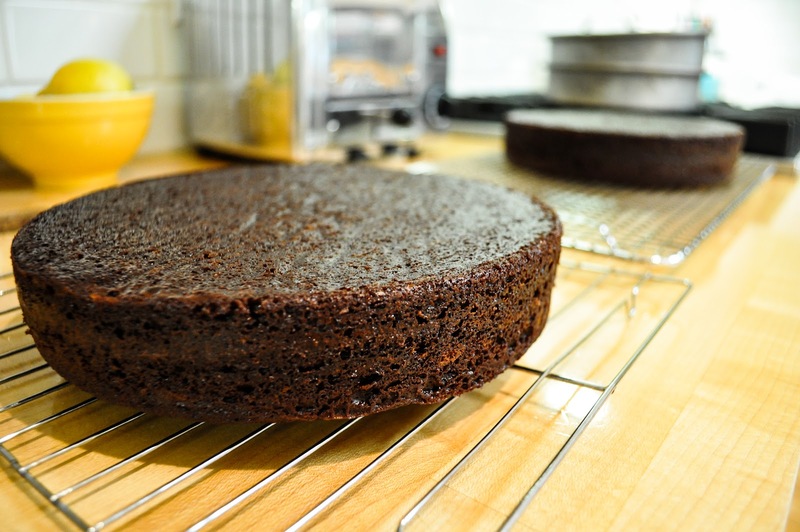 Press your finger down gently in the middle of the cake, if it’s done, it should puff back up automatically on it own. If it stays dented, then the cake is not ready to come out yet. I would err on the side of over baking a bit than under baking when it comes to cake baking. I’m going to update my post and put this tip in. One time I under baked my skillet cookie, as it sunk in the middle once it cooled. With cookies, that’s ok, because they still taste great if they are under baked a bit. If a cake sinks a bit but is cooked through, then you can always hide it with frosting, right? As far as calculating the ingredients to fit at 12″ pan, I’m not sure. I’m not a pastry chef, so when it comes to baking I follow the recipe to at T. I do adapt certain things and change ingredients etc, but not measurements, as I don’t have enough knowledge there. I hope this info helps you! Let me know if you have any additional questions. I have baked this same cake in a 12 inch tin. The calculations I found said I should multiply the quantities by 2.5 It seems to have worked pretty well, apart from the fact it has sunk a bit after being left to cool. Could you tell me what I could do to avoid this happening? Also, is it Caster Sugar that is used in the cake mix? Hi Sharon. It’s actually just C&H pure cane sugar. Thanks for the other info too! The convertion question was also me but I didn’t put my name at the bottom. I’m off to do the 8inch version first and then I’ll try the convertion. I’m planning on making this cake but on a bigger scale. Got lots of mouths to feed! 😀 How would I change the quantities and cooking time to suit a 12″ round cake tin? You know to be honest, I don’t have the answer to that question, as I’m not a pastry chef 🙁 I would google recipe conversions and see what you can find there. I know Barefoot has a chocolate sheet cake that feeds a crowd, you can check out that recipe if you want. This cake does feed a crowd. I have served this cake to 12 people with leftovers. It’s a rich and large cake with the 2 layers, so you want to make the slices on the thinner side (but you will still get a nice piece of cake, especially if you serve it up with a scoop of ice cream). You can always double the recipe and pour it into your two 12″ pans and then check the cakes after 35-40 minutes and gage the cooking time from there. Your cakes will be done when you insert a toothpick into the center and it comes out clean. You could also make 2 cakes, but that would be a lot, I think! I will ask my sister-in-law on the above question though and see what she says, as she is a pasty chef who graduated from the CIA. Also wondering if you can give me a more specific measurement for the confectioner’s sugar. I have a 2 lb bag and unsure how to make sure I do about a 1/2 lb like the recipe calls for. Thanks so much. Hi there! Your friend is going to love this cake. Everyone that I make this for, loves it! Yes, you line the inside of the pan with parchment paper. You basically trace the outline of the pan onto the parchment paper and then cut it out and insert it in the bottom of the pan (not on the sides). I trace the paper so that I have the correct size. Next time I make this, I will include a photo of that step. I’m glad you brought up that it was confusing, so I can make the necessary changes. As for the confectioners sugar, it’s really a taste thing. I typically use about 1 pound or a bit less with the 2 pound bag (about half the bag). I just pour half the sugar out of the 2 pound bag into a bowl (which is about 1 pound). Make sure to shift the sugar first to get out the lumps. You then want to add the sifted sugar to the cream cheese and butter to taste. You will most likely use 3/4 to all of it. You really can’t go wrong with the cream cheese frosting, as it’s to taste. You want to taste a bit of the cream cheese in the frosting but have it taste sweet at the same time. Does that make sense? I think as you make the frosting, you will begin to see what I’m saying. Best of luck and let me know if you have any questions! Hi there D! Sorry, I didn’t specify. It’s 350 degrees. I will change it in the post as well. I hope the cakes turn out wonderful for you. Let me know how it all goes. Hi Basileia! Big hugs to you as well. I’m so excited that the cake and frosting turned out well for you and that your partner loved it. I will let my dad know that his frosting was a hit! This cake is the only cake I make and the recipe will be passed on to my kids. My daughter is actually going to make me this cake for my birthday and follow the step-by-step recipe I posted here. I can’t wait! Thanks for commenting and letting me know how it all worked out for you! I saw the recipe and it looks beautiful, i just wonder about the taste of coffee in the cake! Does it taste strong? Or is it like one of those ingredients that you can’t taste!? I got really curious, specially because I found this exact recipe except instead of coffee it adds water, so it got me thinking! But the cake looks exceptionally beautiful… and yummy! HI there! You totally can’t taste the coffee in the cake. Coffee is a great way to enhance the flavor of cocoa powder, resulting in a more chocolaty cake, not a coffee-flavored one. The coffee also adds a certain richness to the cake and I even use a dark and robust coffee and you can’t taste it. This is a favorite cake of my kids and their peers and they are not coffee fans. The water sounds fine, but I don’t think your cake will be as chocolaty or rich. If you do decide to try the cake with the coffee, please comment back and let me know how it turned out for you! I made the cake this week and you’re right! You really can’t taste the coffee.. It SO moist! I loved the taste! I was even considering doing a frosting with mint essence instead of vanilla, I think it will go really well! Loved this recipe! Thank you! Yaay! I am so glad you made the cake and that it turned out amazing for you. I can say that Barefoot knows her stuff. I love your idea of the mint essence, try it and let me know how it turns out for you. I think my kids would love it as they love mint. Congratulations for being on Marin IJ! This is definitely worth a celebration! Fantastic!! Yay for you!! What a fantastic article, and WHAT a cake! I certainly hope your dream does come true. I’d love to see you teaching cooking on PBS someday and I will continue to happily follow along! Congrats!! Darn girl – you are one talented baker!! My cakes never look that pretty!! And – HA! I remember being a kid and making a yucky face at anything involving coffee or vodka… how times I have changed! LOVE the artcile too – everyone GO READ IT!!! Hi Em! The cake you did for your best friend’s wedding was so beautiful! What are you talking about? This one is not gluten free of course, nor as healthy as yours but it taste extremely good. OMG, this looks incredible! You have done such a fantastic job of it. I love Ina Garten and all her recipes. I love that cake plate. It’s gorgeous. Thanks Asmita! Ina is gotten to where she is because her recipes are truly good and truly easy!